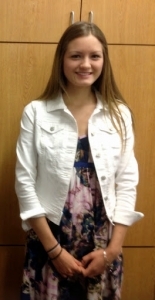 Abigail Shatrau has earned the 2014 Fine Arts Award from the Larry Mitchelson Scholarship Foundation. Abigail will be pursuing her dream of a career in fashion design. She will attend the State University of New York at Oneonta and then plans on completing her schooling at the Fashion Institute of Technology. Abigail is the daughter of Christopher and Denise Shatrau of Oswego, New York.